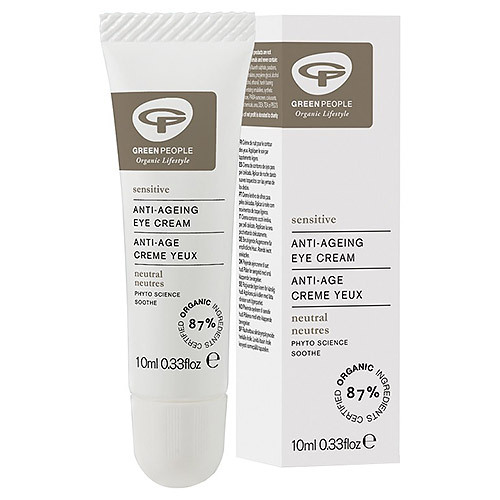 Green People Sensitive Anti-Ageing Eye Cream is a soothing scent free eye cream for sensitive eyes. Suitable for people who may be prone to eczema and psoriasis. Ultra gentle and suitable for very sensitive eyes. Rich in vitamins, minerals and antioxidants. Nourishing night treatment rich in essential fatty acids. Green People Sensitive Anti-Ageing Eye Cream is made without Parabens, Lanolin, alcohol (ethyl alcohol, ethanol), artificial perfumes, petrochemicals, phthalates and colourants to bring you the purest eye cream that nature can offer. Aqua (spring water), butyrospermum parkii (shea) butter*^, helianthus annuus (sunflower) seed oil*, olea europaea (olive) fruit oil*, glycerin* (vegetable derived), squalane (from olive oil), cetyl alcohol (emulsifying plant wax), cetearyl glucoside (plant derived emulsifier), cetearyl alcohol (emulsifying plant wax), elaeis guineensis (palm) oil*^, simmondsia chinensis (jojoba) seed oil*, glyceryl stearate (plant derived emulsifier), caesalpinia spinosa (tara bush) gum, enteromorpha compressa (seaweed) extract, aloe barbadensis (aloe vera) leaf juice powder*, perilla frutescens (perilla) seed oil*, oenothera biennis (evening primrose) seed oil*, persea gratissima (avocado) oil*, baicalin (baical scullcap extract), rosmarinus officinalis (rosemary) leaf extract*, helichrysum stoechas (everlasting flower) extract*, althaea officinalis (marshmallow) root extract*, persea gratissima (avocado) oil unsaponifiables, propanediol (from corn starch), hydrolysed jojoba esters (from jojoba oil), fucus vesiculosus (seaweed) extract, sodium stearoyl glutamate (plant derived emulsifier), citric acid, benzyl alcohol, salicylic acid, sorbic acid. After cleansing, apply eye cream gently to the entire eye contour area with light tapping motions before going to bed. In winter, use day and night. 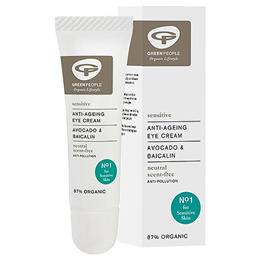 Below are reviews of Green People Sensitive Anti-Ageing Eye Cream - 10ml by bodykind customers. If you have tried this product we'd love to hear what you think so please leave a review. Good texture, non greasy, very pleasant to use but too early to give a fair assessment.